If you live in the northern half of the US, the odds are that you’re familiar with what’s referred to as “Winter Weather”. This specification involves cold temperatures and plenty of snow and ice. Although the scene looks great on a Christmas card, these types of weather conditions can also be very dangerous. Slippery roads are the cause of many vehicle accidents, resulting in approximately 6000 deaths per year. Nearly 22% of all vehicular accidents are weather related. The roadways are not the only source of yearly winter-related injuries however. 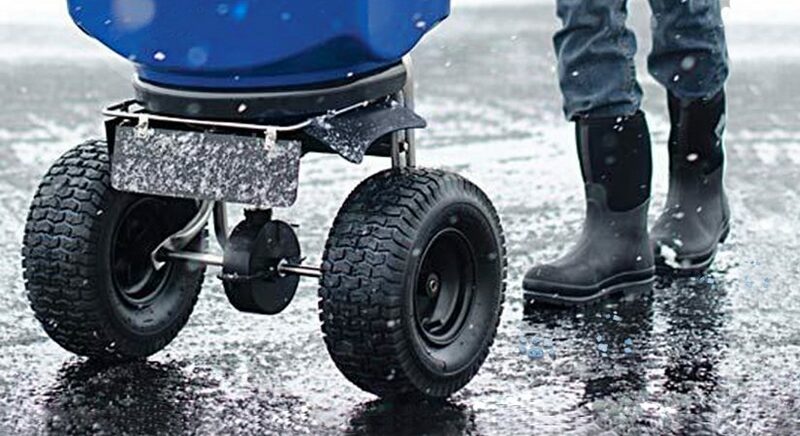 Frozen sidewalks and parking lots also pose a significant threat of slip and fall accidents, which is a major concern for businesses and public areas. Although many methods have been applied over the years to melt ice, the application of a granular product is still the most widespread and cost-effective solution. While several chemicals are used in these products, the three main ingredients that are used most often in commercial ice melt products are Sodium Chloride (also known as rock salt), Magnesium Chloride and Calcium Chloride. There are many factors that play into selecting the right ice melt product for your setting, with one of the most significant being outside temperature. If you are in a region where the temperatures are consistently below 0 degrees Fahrenheit, your choices of ingredients are limited to Calcium or Magnesium Chlorides, since they will both melt ice and snow as low as 20-25 degrees below zero. The presence of vegetation around sidewalks and parking lots also becomes a concern, since sodium and calcium chloride both kill plants and grass if they come into contact. This leaves magnesium chloride, or a magnesium blend such as PowerMELT Green as the leading product in areas where greenery is present. These products are also safer for people and pets than their above mentioned counterparts. Due to the rather high costs of calcium and magnesium chlorides, they are often used in conjunction with sodium chloride, the most economical of the ice melters, and other additive ingredients such as urea and lactic acid to achieve similar results at a lower price tag. Since sodium chloride only melts at 20 degrees Fahrenheit and above, it is often blended with these more costly products to achieve a greater melting range. PowerMELT BLUE is a great example of this that contains sodium chloride, calcium chloride and magnesium chloride. Rock salt is also attributed to rapid concrete damage due to its erosion properties. Although calcium chloride is less harmful to concrete than sodium chloride, it will still cause damage to sidewalks and parking lots when not used correctly. This once again leaves us with magnesium chloride as the better choice for environmental concerns. Another concern when choosing the right ice melter is the residue that some products can leave on entrance mats and lobby floors. Although most products that contain the ingredients mentioned above will leave some residue, straight calcium chloride tends to accumulate more due to the soft nature of the pellets. In settings where the residue is overpowering, many companies will use a blended product to take advantage of the melting power of calcium chloride without the sticky mess. Residue Neutralizers will help significantly in removing this residue from all ice melters, and are often swapped with the daily floor cleaner for the duration of the winter. You can read our full article discussing the removal of ice melt residue here. You now should be able to make an informed decision on which ice melt products will best suit your company’s needs. The most important factor is that you put something in place to assure the safety of your employees and visitors.